Home Fact-Check Fact-Check: Did PM Modi 'admit' that surgical strikes were not carried out, as claimed by Pakistani propaganda? Fact-Check: Did PM Modi ‘admit’ that surgical strikes were not carried out, as claimed by Pakistani propaganda? Ever since India retaliated with the surgical strikes in Pakistan, some people have been extremely perturbed. Pakistan first denied any such attack by India, yet we saw their “experts” promising vengeance. Then they claimed that it was a minor LoC skirmish in which 2 Pakistani soldiers died. Finally, in a case which fits the bill for state-sponsored propaganda, Pakistani agencies shuttled journalists to an area along the LoC, to prove that the surgical strikes did not take place. The comical part was Pakistan took this media contingent to an area of their choice, after a few days had elapsed, and expected the world to believe that this was undeniable “evidence”. The world, of course, did not fall for this as even the European Parliament today backed India’s surgical strikes. The only one who seems to have got influenced was Delhi CM Kejriwal who demanded proof “so that Pakistani propaganda was countered”. He, however, did not fail to share the very propaganda he was trying to counter. These articles have been seen shared by some in India, especially those with leaning towards Congress and AAP, in an attempt to embarrass Modi. The second sentence in the above statement has been deviously twisted by Pakistani media. 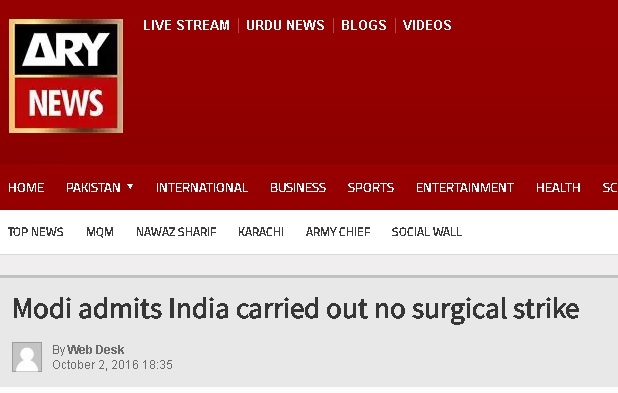 They claim that by saying India has never attacked any other country, Modi has admitted that the surgical strikes did not happen. What they deliberately do not highlight is that the statement was firstly not made in the context of the surgical strike. It was meant to show that India has a history of never being the aggressor country. Even if one were to take it in context of the surgical strikes, the choice of words needs to be seen carefully. Modi says India has not attacked any “country”. This remains a fact even with respect to the latest surgical strikes. The attack was conducted across the Line of Control i.e. in Pakistan Occupied Kashmir, which is very much a part of India. The army did not venture across the international border into Pakistan’s territory. Secondly, the DGMO himself has clearly mentioned that India attacked “terror launch pads” and in the process, anyone who was defending the terrorists within these pockets. This was never an attack on Pakistan or its army. Hence, the PM’s statement is not at all contradictory. But how can we expect Pakistan to comprehend English? Pakistani school textbooks replaced “Good morning” with ‘Assalamo Alaikum’ to satisfy radicals. But can we expect some decency and thoughtfulness from our own Indians, be it from the Congress supporter base or AAP supporter base, before sharing highly misleading Pakistani media reports?